Three hanks of Wild Elk paracord. I’ve been meaning to buy some bright cord for a while. The majority of the cord I’ve been using so far has been green or black. The bright coloured cord should reduce the chance of people walking into it when it’s in use and make it much easier to find stray pieces on the woodland floor. 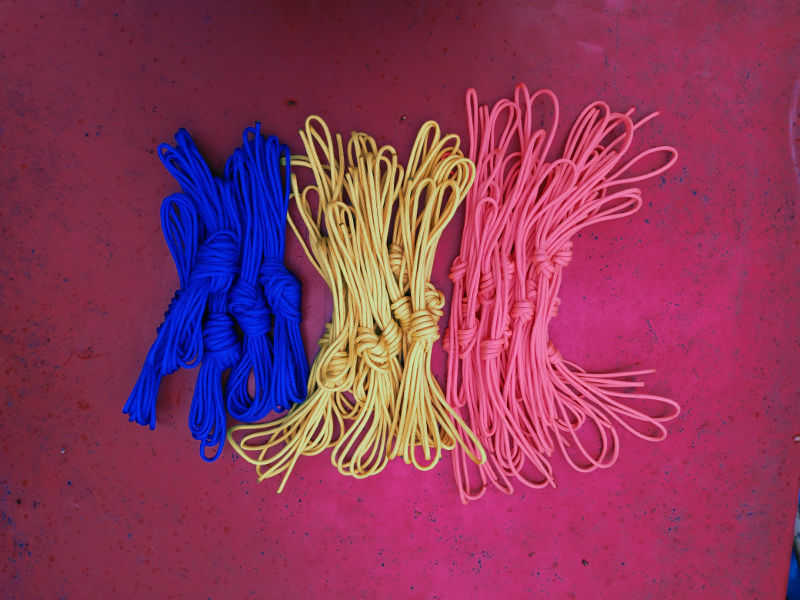 I saw a post on a a Facebook Forest School group recently that suggested using different colours of paracord and cutting each colour in different lengths. Paracord cut into different lengths. I liked the idea a lot so I bought three different coloured 100ft hanks of Wild Elk paracord. The blue I’ve cut into five 20ft pieces, the yellow into ten 10ft pieces and the orange into twenty 5ft pieces. The idea is that it’s much easier to find a suitable length of cord rather than working through all the random pieces that end up sat in the bottom of the box or bag.